Scientists! How do you increase the odds that your science will be reported accurately in the media? How do you increase the chances that your research will be reported on at all? If you have been wondering about questions like this from the world of science journalism, SciFund Challenge has a panel discussion for you. 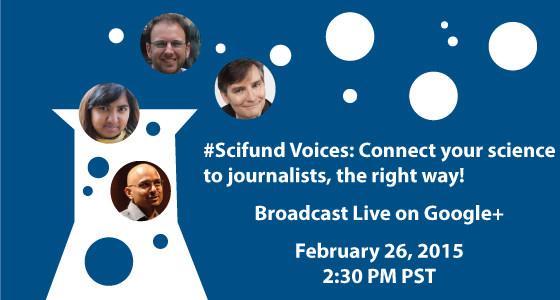 For this month’s SciFund Voices, we’ll be interviewing an online panel of distinguished science journalists to understand how their world works and how to make that world work for you. And we’ll be fielding questions from the audience, via Google+ and Twitter (use the #SciFund hashtag)! Connect your science to journalists, the right way! Watch right here on this page, on Google+, or on YouTube.